½ of ½ (Name Brand Clothing) does not share or sell your information with any other parties. Enrollment in the eInsider program is required to receive your $5 coupon. Your $5 coupon information will be emailed to you. to your address book or the white list of your spam filter. 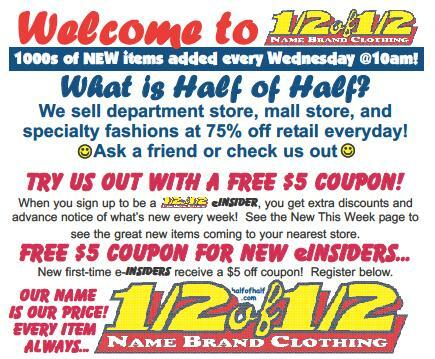 This will ensure that you get your coupons and sales event information!